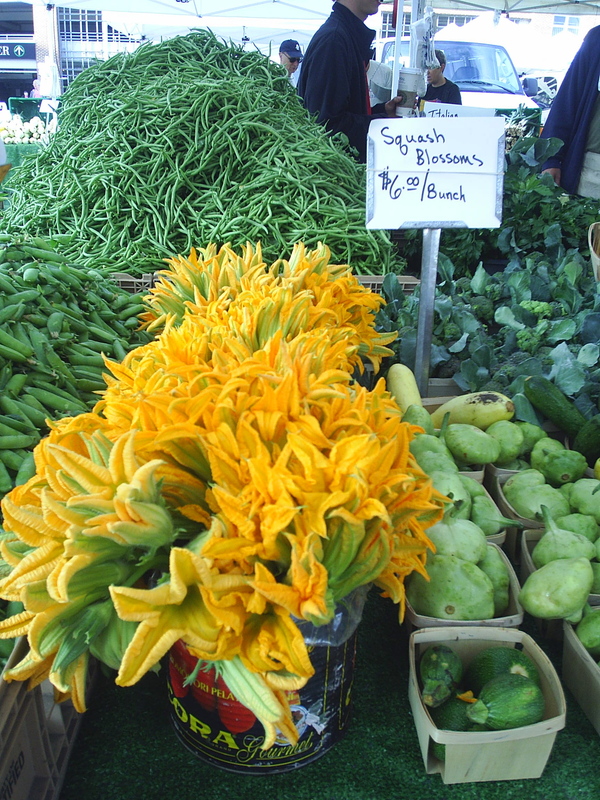 But I digress and get back to earth, back to the present, and back to real fresh food from the Farmers Market….the markets are in abundant swing right now, prime time for doing the localvore thing….something that caught my eye this week were the beautiful squash blossoms. Say wha’? No I am not talking traditional native american necklaces, but the flower of the zucchini plant. If your favorite chefs have not snatched them up and you have time to use them up the same day or at the next (no later. And store in a glass of water or in a ziplock bag with air in it. 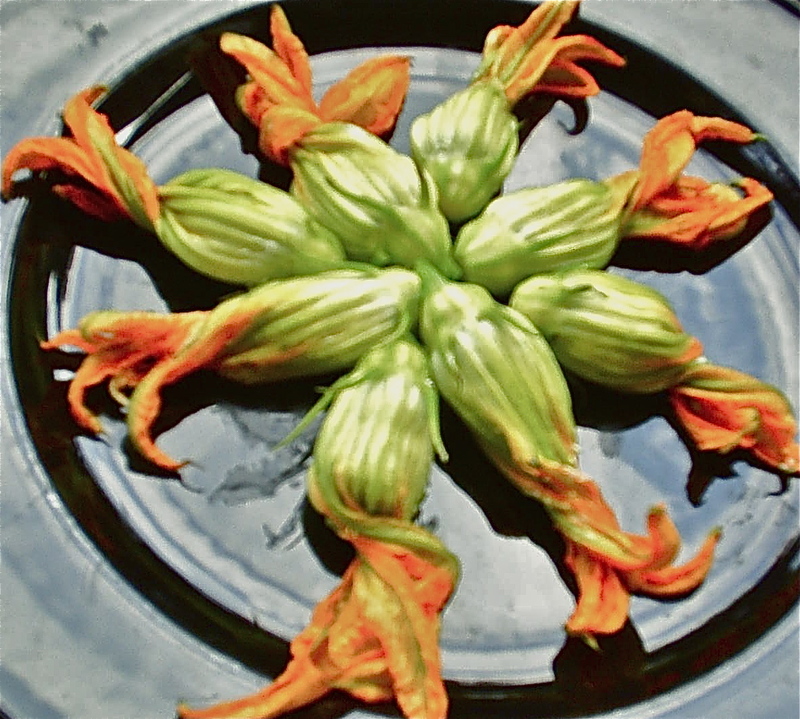 ), nab a bunch of squash blossoms now. 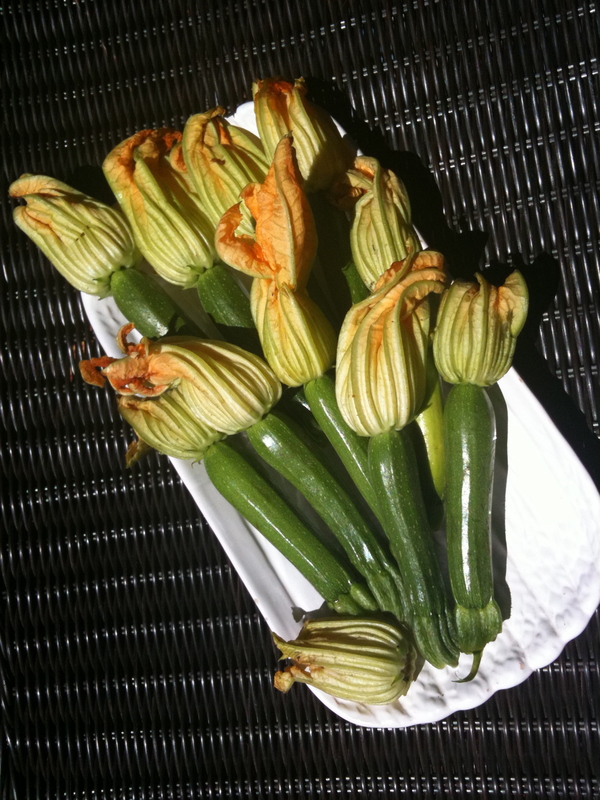 They are a delicate and delectable treat that have a subtle summer or zucchini squash flavor. Packed with potassium, vitamins B&K, and beta carotene these tasty blooms are wonderful in soups, frittatas, quesadillas, bruschetta, on pizza or salads, or served up stuffed and fried. When I picked out a beautiful bunch at the market, I was all set to fry. But after hearing about the mouth-watering menu at the Green City Market BBQ last week (note to self — be sure to order tickets early before they sell-out!) and the squash blossoms that were served stuffed and raw, well I had to give it a whirl. And after all, the root word of squash is the indian word ‘askutasquash’ which means ‘eaten raw’. So that said, forget the frying and eat raw. Carefully remove the stamen (reach in and pull out from inside the blossom). Put blossoms aside. Meanwhile, mix together the cheese, chopped herbs, chopped squash, salt and peppers. Then depending on the size of the blossom carefully put 1 to 1 1/2 teaspoons of the cheese mixture into a blossom. Then gently twist the petals of the blossom together to enclose the stuffing. Fill all of the blossoms then place in the fridge for 15 minutes and then serve immediately. 1 Response to Vegetable or Flower? Your post really struck me. I bought my astronaut food and supplies at the Museum of Science and Industry during field trips in the late 70s. Also, I ate blossoms as a kid; but I don’t remember my mother refrigerating them before frying. I guess the possibility of ice crystals popping in the oil freaked her out.